Cracka Please:: Hilarious Cracka Please Shirts Now Available! Polly want a cracka? 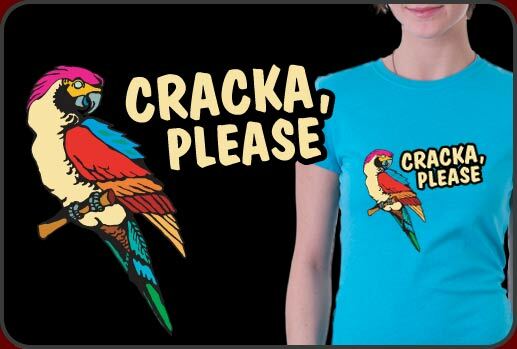 Funny parrot illustration on Cracka Please t-shirts looks great and full of humor. Cracka Please! This is a very funny graphic t-shirt design in tribute to comedian Mike Birbiglia. It's really a very colorful and attractive shirt with all the humor and attitude of Birbiglia's stand-up comedy. Our Cracka Please t-shirt design is available on over one hundred different color and shirt style combinations. Click on the image on the right to create your own and customize it too! You haven't clicked on it yet? Whaz up? Cracka please!